Les chambres sont principalement disponibles durant les vacances d’été (juin, juillet, août, septembre), puisque les étudiants n’utilisent pas les chambres entre les années universitaires. Les chambres sont généralement disponibles deux à trois mois à l’avance. Merci de bien vouloir consulter notre site Internet ultérieurement si aucune chambre n’est disponible à présent. 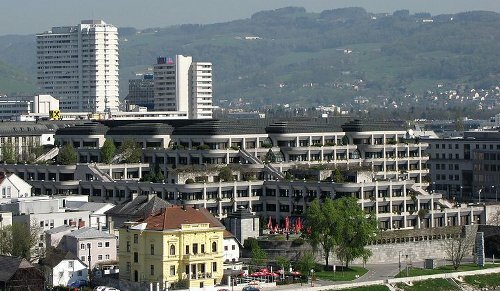 Linz is the third-largest city of Austria and capital of the state of Upper Austria. 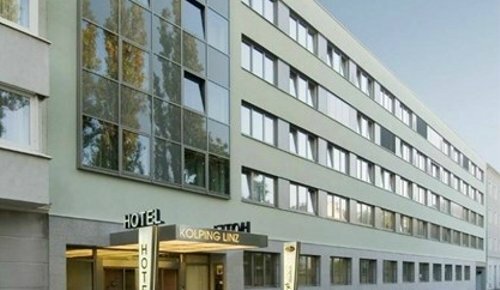 It is located in the north centre of Austria, approximately 30 kilometres (19 miles) south of the Czech border, on both sides of the river Danube. Linz serves as an important transportation hub for the region of both Upper Austria and, to a lesser degree, southern Bohemia. The "Blue Danube" Linz Airport lies about 14 kilometres (8.7 mi) southwest of the town centre, in the municipality of Hörsching. Direct flights include Frankfurt, Düsseldorf and Vienna with additional seasonal routes added during the summer and winter months. Ryanair flies to London Stansted Airport and Air Berlin flies to Berlin-Tegel Airport. The city also has a central station on Austria's main rail axis, the West railway, linking Vienna with western Austria, Germany and Switzerland. There are also varying types of river transport on the Danube, from industrial barges to tourist cruise ships. 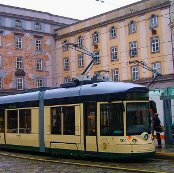 Local public transport comprises the city tram network, the city trolleybus network and the city bus network, all operated by the Linz Linien division of Linz AG. The city tram network includes the Pöstlingbergbahn, a steeply graded tramway which climbs a small mountain at the northwest edge of the town. The main street "Landstraße" leads from the "Blumauerplatz" to "Taubenmarkt" (Pigeonmarket) near the main square. In the middle of the main square the high "Pestsäule” was built to remember the people who died in the plague epidemics. 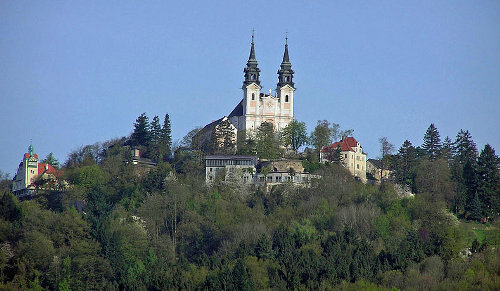 Near the Schloss/castle, being the former seat of Friedrich the III — the oldest Austrian church is located: Sankt/Saint Martins church. It was built during early medieval Carolingian times. 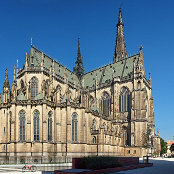 Other points of interest include St. Mary's Cathedral (Gothic-Revival style) and Pöstlingberg-Kirche, a pilgrimage church on the Pöstlingberg Hill. Brucknerhaus is a concert hall named after the composer Anton Bruckner, who was born in Ansfelden, a small town next to Linz. The Gugl Stadium, is home to the Linzer Athletik Sport Klub, which is claimed to be the third oldest football club in Austria. The city was founded by the Romans, who called it Lentia. The name Linz was first recorded in AD 799. It was a provincial and local government city of the Holy Roman Empire, and an important trading point connecting several routes, on either side of the river Danube from the East to the West and Bohemia and Poland from north to the Balkans and Italy to the south. Being the city where the Habsburg Emperor Friedrich III spent his last years, it was, for a short period of time, the most important city in the empire. It lost its status to Vienna and Prague after the death of the Emperor in 1493. One important inhabitant of the city was Johannes Kepler, who spent several years of his life in the city teaching mathematics. He discovered, on 15 May 1618, the distance-cubed-over-time-squared — or 'third' — law of planetary motion. The local public university, Johannes Kepler University, is named after him. Another famous citizen was Anton Bruckner, who spent the years between 1855 and 1868 working as a local composer and organist in the Old Cathedral, Linz. The Brucknerhaus is named after him.